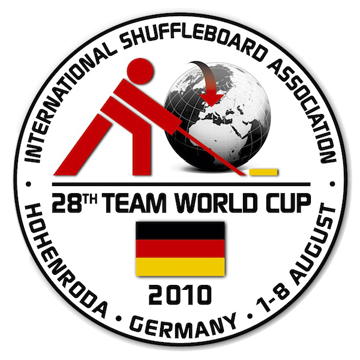 Welcome to the 28th Shuffleboard Team World Cup! Please look through the columns above for more detailed information. All scores are updated live from the courts. Rank Team Pts. W L T Played Pct. The tournament is over! Congratulations to the men of USA and the women of Canada! At 07:30 PM (german time): World League presentation! Thursday, August 5th: back to the courts after a wonderful day full of excitement. However, we have to report that Kerstin Runge (GER) and Durelle Kowacz (CAN) had to drop out from the tournament due to health reasons. They have been replaced by Fatima Alves and Maureen Bryan respectively. We wish both players a full and quick recovery. Tomorrow (Wednesday): Excursion-Day! - Sorry, no matches. Match of the Round for Round 1: Court 3 Head - Marcos Cardoso and Carl Howell. Congratulations to the 2010 I.S.A. Hall of Fame inductees: Sachiyo Takada, Marcos Cardoso, Max Tate and Earl Ball.